HTML 5 is the next major version of HTML. It introduces a bunch of new elements that will make our pages more semantic. This will make it a lot easier for search engines and screenreaders to navigate our pages, and improve the web experience for everyone. In addition, HTML 5 will also include fancy APIs for drawing graphics on screen, storing data offline, dragging and dropping, and a lot more. Let’s get started marking up the blog page. In HTML 5, there is only one doctype. It is declared in the beginning of the page by <!doctype html>. It simply tells the browser that it’s dealing with an HTML-document. The new tag header is wrapped around introductory elements, such as the page title or a logo. It could also contain a table of contents or a search form. Every header typically contains a heading tag from <h1> to <h6>. In this case the header is used to introduce the whole page, but we’ll use it to introduce a section of the page a little later. 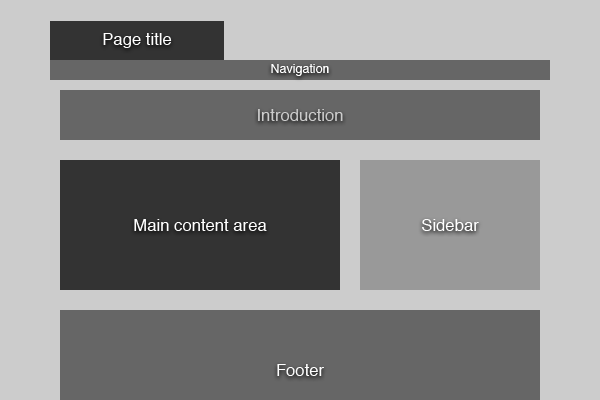 The nav-tag is used to contain navigational elements, such as the main navigation on a site or more specialized navigation like next/previous-links. The section-tag is used to denote a section in the document. It can contain all kinds of markup and multiple sections can be nested inside each other. aside is used to wrap around content related to the main content of the page that could still stand on it’s own and make sense. In this case we’re using it for the sidebar. The footer-tag should contain additional information about the main content, such as info about who wrote it, copyright information, links to related documents and so on. Instead of using divs to contain different sections of the page we are now using appropriate, semantic tags. They will make it a lot easier for search engines and screen readers to figure out what’s what in a page. The navigation is marked up exactly like we would do it in HTML 4 or XHTML, using an unordered list. The key is that this list is placed inside the nav-tags. We have already defined a new section in the document using the section tag. Now we just need some content. We add an id to the section tag so we can identify it later when styling. We use the header tag to wrap around the introductory h2 element. In addition to describing a whole document, the header-tag should also be used to describe individual sections. Our main content area consists of three sections: the blog post, the comments and the comment form. Using our knowledge about the new structural tags in HTML 5, it should be easy to mark it up. Go through the markup and I’ll explain the new elements afterwards. We start a new section and wrap the whole blog post in an article-tag. The article tag is used to denote an independent entry in a blog, discussion, encyclopedia, etc. and is ideal to use here. Since we are viewing the details of a single post we only have one article, but on the front page of the blog we would wrap each post in an article-tag. 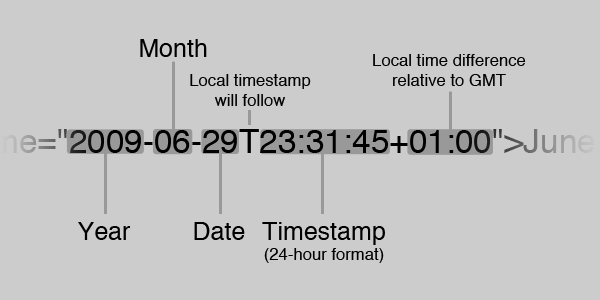 The time zone relative to GMT. I’m in Denmark which is 1 hour after GMT, so I write +01. If you were in Colorado you would be 7 hours behind GMT, and you would write -07. Marking up the comments is pretty straight-forward. No new tags or attributes are used. Several enhancements to forms have been introduced in HTML 5. You longer have to do client-side validation of required fields, emails, etc. The browser takes care of this for you. There are new two new types of inputs, email and url. Email specifies that the user should enter a valid E-mail, and url that the user should enter a valid website address. If you write required as an attribute, the user cannot submit an empty field. “Required” is a boolean attribute, new to HTML 5. It just means that the attribute is to be declared without a value. The markup of the sidebar and footer is extremely simple. A few sections with some content inside the appropriate aside- and footer-tags. You can view the final, unstyled markup here. Now for the styling. CSS 3 builds upon the principles about styles, selectors and the cascade that we know so well from earlier versions of CSS. It adds loads of new features, including new selectors, pseudo-classes and properties. Using these new features it becomes a lot easier to set up your layout. Let’s dive in. First we reset margin- and padding-styles with a simple rule. In a production environment I would use a more complete CSS Reset such as Eric Meyer’s (for CSS 2.1) but for the scope of the tutorial this will do. We then tell the browser to render all the new HTML 5 elements as block. The browsers are fine with elements they don’t recognize (this is why HTML 5 is somewhat backwards compatible), but they don’t know how those elements should be rendered by default. We have to tell them this until the standard is implemented across the board. Also note how I’ve chosen to size the fonts in pixels instead of ems or %. This is to maintain the progressive nature of the tutorial. When the major browsers one day are completely finished implementing HTML 5 and CSS 3 we will all have access to page zooming instead of just text resizing. This eliminates the need to define sizes in relative units, as the browser will scale the page anyway. See what the page looks like with the basic styling applied. Now we can move on to styling the rest of the page. No additional styles are required for the header, so we’ll go straight to the navigation. Now we’ll define some additional styles to make the navigation items look prettier and align them to the grid the layout is based on. I’ve also included a style for highlighting the page the user is on, and some custom styling for the subscription-link. The markup for the introduction is pretty simple: A section with a heading and a paragraph of text. However, we’ll use some new CSS 3 tricks to make it look more appealing. We are using two new properties. The first one is background-size, which allows you to scale the background-image. In our case, we scale it to 100% on both axes. If the box expands as we add more content to it, the gradient background will scale as well. This is something that was not possible in CSS 2.1 without non-semantic markup and miscellaneous browser issues. The second new property is border-radius, which applies rounded corners to the element. The radius of our rounded corners are 22px in every corner. You could specify different values for each corner or choose to only round individual corners. Unfortunately, neither of the properties are fully implemented into the major browsers. However, we can get some support by using vendor-specific attributes. Background-size is supported by newer versions of Safari, Opera and Konqueror. Border-radius is supported by newer versions of Safari and Firefox. Since we have a background-color defined, there will be no major problems in browsers that don’t support background-size, such as Firefox. Now we just need to style the heading and the text. 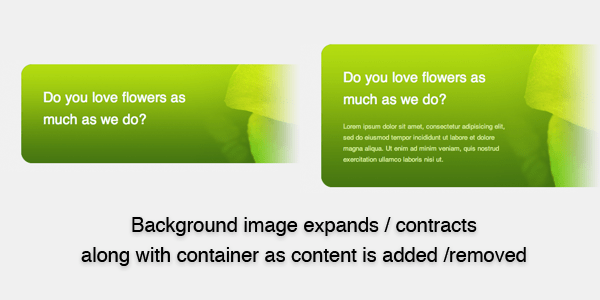 The flower image can be added easily by giving #intro a second background image, something that CSS 3 supports. We give the two background images explicit dimensions to ensure that they don’t overlap, and we’re set. Note the shorthand notation of background-size. Unfortunately, no browser reliably supports this yet, so we’ll have to do it the old-fashioned way: by including an inline image and positioning it using CSS. See the final example to see how it was done. The content area and sidebar are going to be aligned beside each other. 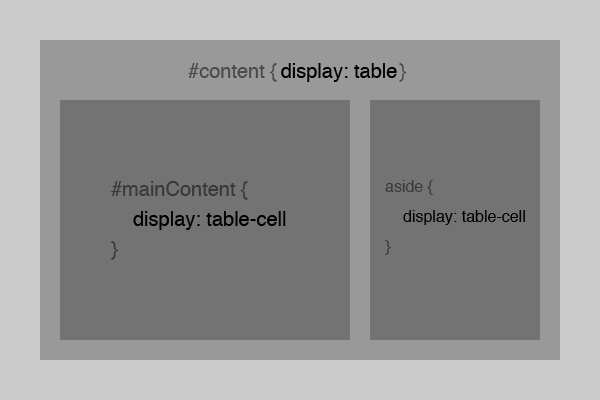 Traditionally you would do this by using floats, but in CSS 3 we are going to use tables! “What?! Tables?” you might ask and look confused. You probably learned years ago that using tables for web layout is a big no-no, and it still is. You should never use the table-element to mark up a layout. However, in CSS 3 we can make elements behave like tables without it ever showing in the markup! To start off with, we’re going to need some divs to group the sections in a little more logical manner. That’s all! No more floating, faux column background images, clearing or collapsing margins. We’ve made the elements behave like a table, and this makes it much easier for us to do layout. The styling of the post header is rather trivial so I’ll skip to the fun part: the multi-column layout. Multiple columns of text was previously impossible without manually splitting the text, but with CSS 3 it’s a piece of cake, although we have to add a div around the multiple paragraphs for this to work with current browsers. Now we can add two simple properties and call it a day. Of course the column-count and column-gap properties are only supported by some browsers, Safari and Firefox. We have to use the vendor-specific properties for now. If you look closely at the image in the blog post you’ll see a drop-shadow. We are able to generate this using CSS 3 and the box-shadow property. The first “3px” tells the browser where we want the shadow to stop horizontally. The second “3px” tells it where we want the shadow to stop vertically. The last “7px” is how blurred the border should be. If you set it to 0 it will be completely solid. Last but not least we define the base color of the shadow. This color is of course faded, depending on how much you blur the shadow. It probably comes as no surprise that this property is not implemented in all browsers yet. In fact, it only works in Safari, and you have to use the vendor-specific property. 2n selects every second item. If you wrote 3n it would select every third item, 4n every fourth item, and so on. The +1 tells the browser to start at element 1. If you are familiar with programming you probably know that all arrays start at 0, and this is also true here. This means that element 1 is actually the second element in the series. Since the standard includes the two most used values as shorthand, odd and even. The rest of the comment styling should be simple to understand with your new knowledge. A couple of CSS 3 techniques are reused in the styling of the comment form, footer and sidebar. In the comment form and the footer I’ve used the same type of table layout technique used in the main layout. In the sidebar border-radius is used to add rounded corners to the different sections. See the final design with all styling applied. 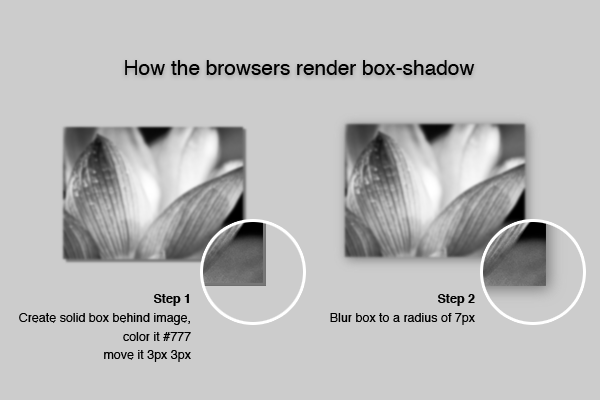 The page renders correctly in Safari 4 and newer webkit-based browsers, as it is the only rendering engine that supports all of the CSS 3 techniques we have used. Firefox 3 has some problems applying rounded corners to our flower image and it doesn’t support background-size, but besides that the layout works. I’ve chosen to ignore Internet Explorer as it requires a bit of hacking to get HTML 5 to work. You could also define some more rules and get everything working across major browsers, but all of this is outside the scope of the tutorial. This entry was posted in webDesign and tagged tutorial on June 22, 2011 by Meggie. Its like you read my mind! You appear to understand a lot about this, such as you wrote the e-book in it or something. I think that you simply could do with a few p.c. to pressure the message home a little bit, however instead of that, this is wonderful blog. A fantastic read. I’ll definitely be back. I’ve read some just right stuff here. Certainly price bookmarking for revisiting. I surprise how much effort you place to make this sort of magnificent informative website. there any other web site which presents these information in quality? What’s up to every body, it’s my first pay a visit of this webpage; this website contains awesome and really excellent stuff in support of visitors.